SpaceX's uncrewed Dragon spacecraft is seen here just after leaving the International Space Station on Feb. 10, 2015. SpaceX's robotic Dragon capsule is headed back to Earth after spending one month attached to the International Space Station, marking the start of a big day for the private spaceflight company that also includes a satellite launch and bold rocket landing attempt. 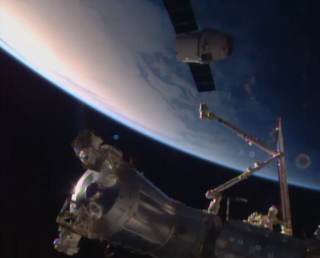 The uncrewed Dragon supply ship — carrying hardware and experiments back from the station — cast off from the space station at about 2:10 p.m. EST (1910 GMT) today, Feb. 10. Dragon will splash down in the Pacific Ocean at 7:44 p.m. EST (0044 Feb. 11 GMT), where a recovery ship is standing by to retrieve the capsule. If all goes according to plan, the splashdown should occur just hours after SpaceX is due to launch a Falcon 9 rocket carrying Deep Space Climate Observatory (DSCOVR) space weather satellite into orbit. SpaceX also hopes to try to land the rocket on a drone ship in the Atlantic Ocean after delivering the satellite to space. Dragon launched to the space station atop a Falcon 9 rocket from Florida on Jan. 10. The capsule linked up with the laboratory about two days later, delivering fresh supplies to the crewmembers onboard. SpaceX's uncrewed Dragon flies far from the International Space Station as the capsule prepares to splashdown in the Pacific Ocean on Feb. 10, 2015. SpaceX attempted to land the first stage of Dragon's Falcon 9 rocket on the drone ship in the Atlantic in a reusable rocket test similar to the one the company is attempting today. The rocket stage landing wasn't successful. The Falcon 9 exploded when it crash-landed on the drone ship. The Dragon capsule is currently the only robotic cargo spacecraft capable of bringing items back to Earth from the International Space Station. Other spacecraft, such as Europe's ATVs and Russia's Progress vehicles, deliver supplies to the station, but those vehicles burn up harmlessly in Earth's atmosphere after departing the laboratory. Today will mark the end of SpaceX's fifth official supply run to the station once Dragon splashes down in the Pacific. The company currently holds a $1.6 billion contract with NASA to fly 12 uncrewed missions to orbit using the Dragon and Falcon 9. The private spaceflight company Orbital Sciences Corp. also holds a cargo contract with NASA; however, Orbital's flights are currently on hold due to a rocket accident that destroyed one of the company's Cygnus spacecraft seconds after launching toward the station in 2014.